Our private courses and friends & family courses are offered at multiple locations in the Los Angeles area. Our students are able to have their classes close to where they live as a result of our multiple locations. Nuestros cursos privados y cursos de amigos y familiares se ofrecen en varias ubicaciones en el área de Los Ángeles. Nuestros estudiantes pueden tener sus clases cerca de donde viven como resultado de nuestras múltiples ubicaciones. We offer seven English courses as private classes and as small group friends & family classes (2-4 students). With each of our courses, students receive 20-hours of class time from a college educated and experienced English teacher. Most students choose to take our courses over 4-weeks. However, our students can also choose to condense their 20-hours of class time into 3-weeks and or stretch their class time up to 5-weeks. Below is an article from our Blog section which illustrates why we offer multiple locations throughout greater Los Angeles for our students. As we all know from living in Southern California, LA traffic jams can make driving very slow. We offer multiple locations throughout greater Los Angeles for our students’ convenience. For more information see our Multiple Location page. 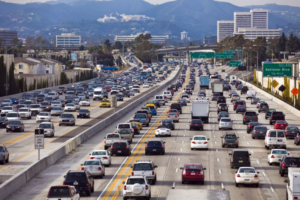 Below is an article from Curbed Los Angeles which lists Los Angeles as having the most traffic congestion of all cities in the United States.